Andrews McMeel Publishing, 9781449401092, 240pp. 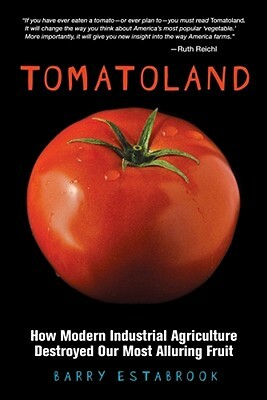 Based on a James Beard award-winning article from a leading voice on the politics of agribusiness, Tomatoland combines history, legend, passion for taste, and investigative reporting on modern agribusiness and environmental issues into a revealing, controversial look at the tomato, the fruit we love so much that we eat $4 billion-worth annually. Supermarket produce sections bulging with a year-round supply of perfectly round, bright red-orange tomatoes have become all but a national birthright. But in Tomatoland, which is based on his James Beard Award-winning article, "The Price of Tomatoes," investigative food journalist Barry Estabrook reveals the huge human and environmental cost of the $5 billion fresh tomato industry. Fields are sprayed with more than one hundred different herbicides and pesticides. Tomatoes are picked hard and green and artificially gassed until their skins acquire a marketable hue. Modern plant breeding has tripled yields, but has also produced fruits with dramatically reduced amounts of calcium, vitamin A, and vitamin C, and tomatoes that have fourteen times more sodium than the tomatoes our parents enjoyed. The relentless drive for low costs has fostered a thriving modern-day slave trade in the United States. How have we come to this point? Estabrook traces the supermarket tomato from its birthplace in the deserts of Peru to the impoverished town of Immokalee, Florida, a.k.a. the tomato capital of the United States. He visits the laboratories of seedsmen trying to develop varieties that can withstand the rigors of agribusiness and still taste like a garden tomato, and then moves on to commercial growers who operate on tens of thousands of acres, and eventually to a hillside field in Pennsylvania, where he meets an obsessed farmer who produces delectable tomatoes for the nation's top restaurants. Throughout Tomatoland, Estabrook presents a who's who cast of characters in the tomato industry: the avuncular octogenarian whose conglomerate grows one out of every eight tomatoes eaten in the United States; the ex-Marine who heads the group that dictates the size, color, and shape of every tomato shipped out of Florida; the U.S. attorney who has doggedly prosecuted human traffickers for the past decade; and the Guatemalan peasant who came north to earn money for his parents' medical bills and found himself enslaved for two years. Tomatoland reads like a suspenseful whodunit as well as an expose of today's agribusiness systems and the price we pay as a society when we take taste and thought out of our food purchases. James Beard Award-winning journalist Barry Estabrook was a contributing editor at Gourmet magazine for eight years, writing investigative articles about where food comes from. He was the founding editor of Eating Well magazine and has written for the New York Times Magazine, Reader's Digest, Men's Health, Audubon, and the Washington Post, and contributes regularly to The Atlantic Monthly's website. His work has been anthologized in the Best American Food Writing series, and he has been interviewed on numerous television and radio shows. He lives and grows tomatoes in his garden in Vermont.